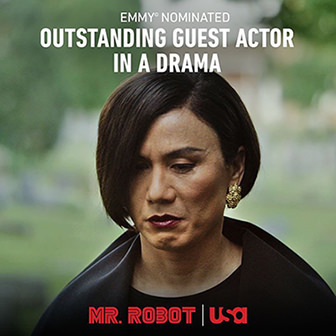 When I saw that BD Wong was recently nominated for an Emmy, my first instinct was to offer congratulations. So I was surprised when I saw an Asian American group refrain from offering kudos and take the stand that only trans actors should get trans roles. Sort of makes sense. Unless you’ve actually watched the show. In Season 2 of “Mr. Robot,” Wong plays “whiterose,” the leader of a Chinese-based hacking organization known as the Dark Army. Talk about gender fluid, “whiterose” is often seen as a woman, but presents publicly as Minister Zhang, the male Chinese Minister of State Security. Are we talking trans man? Or a woman portraying a man? Or a trans woman? If you’ve watched “Mr.Robot,” then you know such conundrums about reality and identity are part of the show’s mysterious charm. But on the trans issue, it appears to be pushing the debate on who gets to play whom in showbiz in a new direction. Still, Wong said he questioned whether to take the role, as he too felt that trans actors should play trans people. But he said he was swayed by the vision of the show’s creator Sam Esmail, who seems to have created a totally ambiguous character who can be both politically correct and incorrect at the same time. Wong said when he signed on in season 2, he was left totally in the dark about the character. That means much of what we saw was Wong’s imagination totally. That alone suggests the Emmy-worthiness of his portrayal. On the podcast, we also talk about how Wong came to acting while in high school, despite seeing few Asian faces in movies and TV. It’s a lesson for a new generation of Asian Americans who have a yearning to be in the arts, but have parents who want them to be doctors or lawyers. Certainly, it’s reminiscent of the message Alan Yang gave after winning an Emmy last year. We also touch on the “Hawaii Five-0” story, and how BD is becoming an Oscar-voting member of the Academy of Motion Picture Arts and Sciences. He said progress is slowly being made in TV and the movies, and while change will never be to our satisfaction, it is coming. Listen to my conversation with BD Wong on the latest edition of Emil Amok’s Takeout. I also talk about the Asian American Journalists Association (AAJA) convention this week. It’s in Philadelphia, where I hope to meet up with Philadelphia councilman David Oh, who is trying to end an unfair harassment of Chinese takeout restaurants ticketed by police for being open late. Oh was interviewed in a previous episode of Emil Amok’s Takeout. This year will also be the inaugural AAJA Story Slam competition. It’s like a Moth for Asian American journalists. I was chosen as a finalist and will be up against five other storytellers on Friday around 5 pm in Congress Hall A/B (4th floor) at the Loews Philadelphia Hotel in Center City. If you’re in the area, drop by. It’s AAJA’s anti-karaoke event!